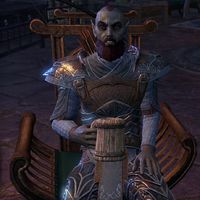 Evos Hledas is a Dunmer who can be found in Saint Delyn Plaza in Vivec City. He works with the Hall of Justice to disrupt the local and illegal production of moon sugar. "Are you working with the Temple? Tell Omoril that we need someone for this moon sugar operation. Now." "Are you the 'miss-informant' sent by the Temple? The more we wait, the closer those bandits get to succeeding." I would like more information before I enter Zainsipilu. "I would personally love to put an arrow through the skull of every single bandit in that cave, but I've been told this case needs finesse. Plant the notes without the bandits noticing, and we should be able to keep them preoccupied for awhile yet." Why aren't the authorities clearing out the bandits? "Too much risk, too much trouble. Better to simply confuse the s'wits. We can keep them occupied, cooped up in their cave, and stop contraband from invading our shores. The more they fail to grow moon sugar, the more determined they seem to get." What's special about these notes? "Just some gibberish the Temple came up with. They contain enough technical terms to appear legitimate, but say nothing that's actually going to help the moon sugar's growth. It should keep the bandits trying and trying, with no success." You seem to have it out for these bandits. "Hard not to take it personally sometimes. My own sister robbed our parents blind to pay for her skooma habit before running off with some fetcher. When I came to Vvardenfell I promised I'd never let that happen to any family under my watch." "I hope you're here to report your success. Can't afford to have skooma invade Vvardenfell." I planted the misleading notes. "Anything to stop skooma from invading Vvardenfell is worthy of a reward. Hopefully one day we can stop this operation in its tracks, but for now you've done a great deal to prevent these bandits from reaching their despicable goals." "Anyone who helps keep skooma out of Vvardenfell is alright in my book. You've done the citizens of this island a great favor."